This will be my second year as a art vendor at the Music is Art Festival! This year the festival is Saturday September 21st and it runs all day. We set up at Delaware Park behind the Albright Knox and just like last year, I should be right near the rose garden. What kinds of things do you want to see? Let me know. I want to stock up my booth with lots of happy awesomeness. Leave a comment with what you'd like to see and I'll make it happen. Even though I don't follow football, I had a request for a custom monster in Packer's colors and I happily accepted! He was fun to make. The logo on his body is felt that I carefully cut out and stitched by hand. He even has his own little Cheesehead hat... which, after much thought, I made out out a sponge that I cut and painted. This weekend is the Elmwood Avenue Festival of the Arts! Yay! If you go, you'll have to find me because I'm actually a part of the UUCB Arts + Crafts Show in the church on the corner of Elmwood and West Ferry. This week I'll give you some sneak peeks at the fun stuff I've been making for this show! The past few days I've been knitting animal ornaments like crazy. I love monsters, but sometimes it's nice to have a little variety. So far I've made narwhals, a few walrus and a couple foxes. No hedgehogs yet... but if you'd like me to make some, leave a comment and I will! 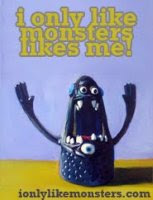 ChalkFest Buffalo 2013 is this weekend and I'll be there with my monsters vending on SATURDAY! [August 3rd] I hope to see some of you there. It looks like it is going to be a great family-friendly event.